On 10 October 1770 Lord Brabazon laid the foundation stone of the new Hospital in the Coombe. The hospital, known as The Meath Hospital and County Dublin Infirmary, was opened the following year. In 1823, the hospital was purchased by Dr John Kirby and moved to a site known as Dean Swift’s Vineyard in Heytesbury Street. In 1826 Mrs. Margaret Boyle founded the Coombe Lying-In Hospital in the vacated building. In 1967 the hospital was relocated to new premises in Dolphins Barn. 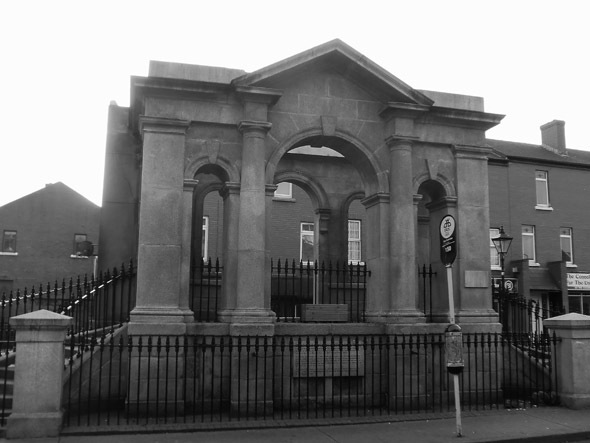 The old building was demolished to make way for a Dublin Corporation housing development, retaining the entrance porch as a monument.